At 11am on Sunday 29 September 2013, former staff of Wellington Radio ZLW marked the 20th anniversary of the station’s closure with an event on the site of the former coast radio station. The site, on Te Ahumairangi Hill – formerly known as Tinakori Hill, Mount Etako or Mt Wakefield – has been made into a lookout area with picnic tables. 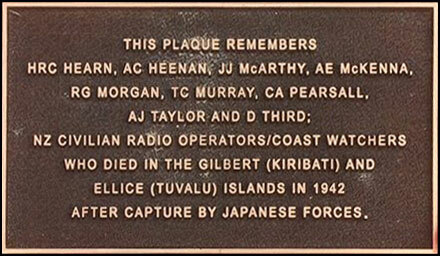 The highlight of the ceremony was the unveiling of a new picnic table, with two memorial plaques embedded in its surface – one marking the site of the former ZLW building and the other honouring nine New Zealand civilian radio operators killed by Japanese forces after being taken prisoner in Kiribati in 1942. On the same day, members of the Musick Point Radio Group hosted a reunion for former staff of Auckland Radio ZLD at Musick Point, as well as a day of on-air activities on the amateur radio bands. 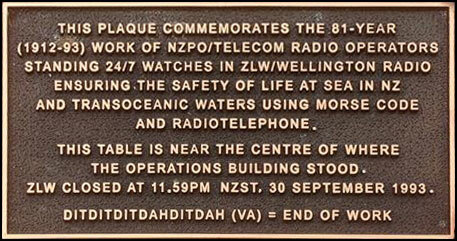 Both stations were closed on 30 September 1993, when all marine radio services were moved to Taupo Maritime Radio ZLM. The Dominion Post newspaper reported the Te Ahumairangi Hill ceremony on 12 Oct 2013 in an article by Tim Donoghue titled Belated tribute for a little-known war story.